The Pizza Files: Stefanina's July 2011. Binge 2011 Stop 9. Fridays are days of weakness, or maybe I just like to celebrate the coming of the weekend. I eat a lot of pizza on Fridays, and Stop nine happened to be on a Friday, so I found myself ordering from Stefanina's Pizzeria and Restaurant. 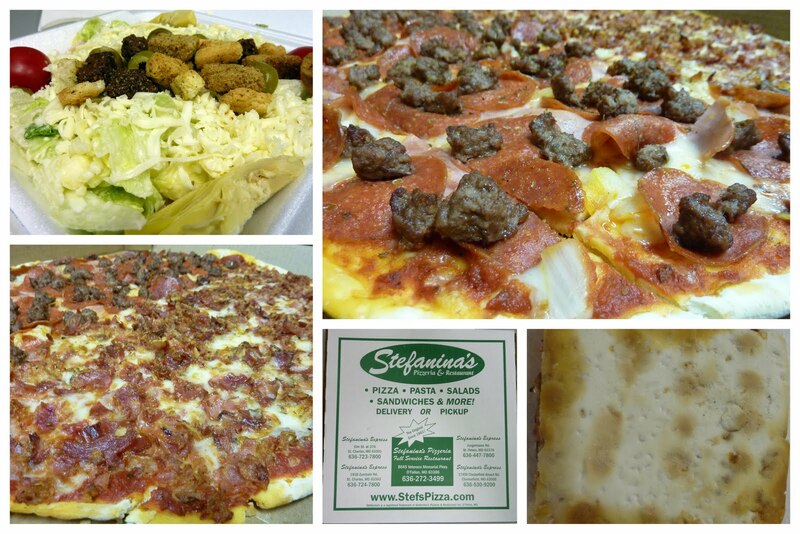 Stefanina's does St Louis Style Pizza, but you have the option of getting mozzarella cheese, and we did. We started with a House salad and House Italian dressing. For pizza we had a large half bacon and half pepperoni, ham, hamburger & onion. It was all very good, even the bacon pizza. There was plenty of leftovers and the next morning I found a great use for them, see my previous post. Recommended But get the Mozzarella. Thank you for the nice words! We had oven problems last Friday, so having a successful review is great. If you are in the O'Fallon area again, please be sure to say hello. Bill, your welcome. I enjoyed the meal and I have to say that bacon pizza was great the next morning for breakfast. I try to include the location when there are more than one, but just don't always remember. This pizza was from your St Peters location on Jungermann.